June 14th on Women's Magazine, Kate Raphael talks with queer activists from Palestine, Toronto and San Francisco about the Israeli government's efforts to win support from the lesbian/gay/bi/trans community during this Pride season. Simin Yahaghi talks with Iranian filmmaker Shirin Neshat about her spectacular new film, "Women Without Men," and Fabled Asp founder Laura Rifkin tells us why 2010 Is the Year for Honoring Disabled Lesbians. The state of Israel has been courting the international gay community, promoting itself as the only gay-friendly democracy in the Middle East. 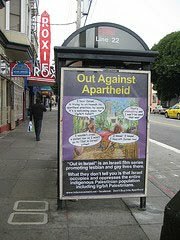 But queer activists in Palestine, as well as in the U.S. and Canada, say this "pinkwashing" won't wash. Natalie Koury-Towe of Queers Against Israeli Apartheid (Toronto), Carla Schick of Queers Undermining Israeli Terrorism (SF Bay Area) and Ghadir of Aswat-Palestinian Gay Women (Palestine). Audio 25 mins. Kate Raphael talks with Laura Rifkin and Marion Abdullah of Fabled Asp, an oral history and archiving project preserving the stories of fabulous disabled lesbian activists. Audio 5 mins. 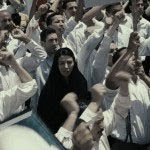 Simin Yahaghi talks with Iranian filmmaker Shirin Neshat about her new film, Women Without Men. This stunning debut film shows how the liberation of Iranian women parallels the liberation of Iran. Audio 18 mins.